In 2004 he graduates from Carol Davlila University of Medicine and Pharmacy-Faculty of Dentistry. Between 2005 and 2010 he was part of the teaching staff at the Endodontics Department from Carol Davila University of Medicine and Pharmacy-Faculty of Dentistry. He is currently giving classes and doing conferences regarding Endodontics in collaboration with various faculties, scientific societies and professional associations. These classes are designed for dentists from Romania and abroad. He develops endodontic treatments for City Dent patients but also those who are referred by colleagues from different offices. 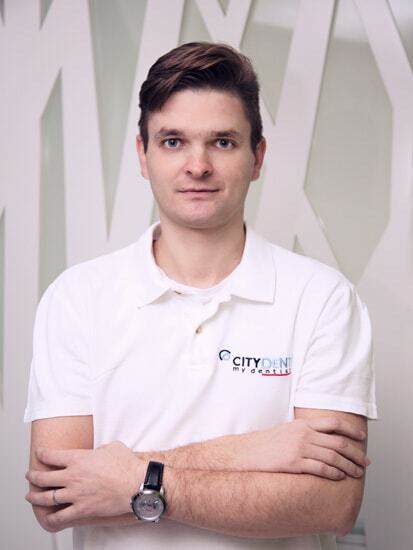 He is the medical coordinator of the City Dent team. He deals within the clinic with microscope-assisted endodontics, root canal treatment under microscope, root canal retreatment, ablations (metal pivots and broken needles on the root canal).